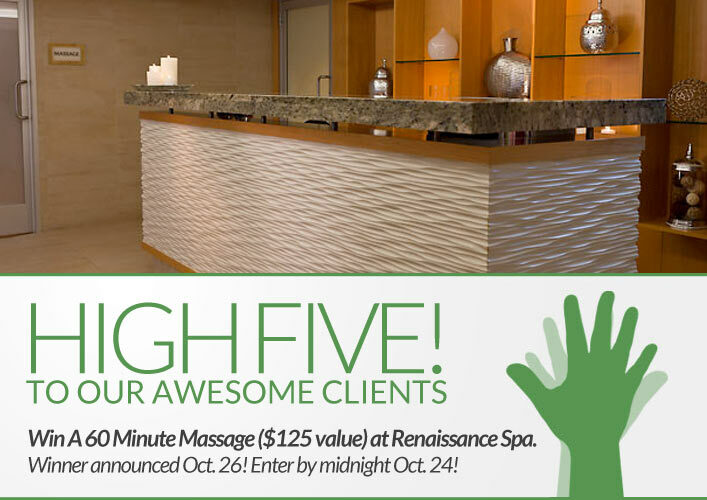 Win a 60 Minute Massage at the Renaissance Hotel Spa! Congratulations to Sue Michmerhuizen on winning our thirteenth High Five Giveaway and thank you to all who entered. The Renaissance Hotel Spa, located at 1 West Wacker Drive, provides massage, facials, manicures, and pedicures. It also includes a whirlpool and steam room. Click here to visit their website or call them at 312-795-3332 for more information. Our Fall Trends blog post talks about adventurous color options. What would be the the most adventurous color you would choose for your hair? This question has no wrong answer. All who comment will be entered to win! Now, just add a comment to this post with the right answer to be eligible to win! The winner will be announced on Friday, October 26. Entries must be received by midnight on Wednesday, October 24. Good luck! I think I would try ombre for the fall! A dark brown with light brown at the ends…something that looks natural yet, with alittle pop! I love ombre…it looks so natural and beautiful. I think it would be fun to try a overall vibrant shade of auburn for fall. I’ve never been one for coloring my hair, but if I were to do anything, I’d probably get blue highlights to give my dark hair an interesting blue-black twist. Blonde! I have dark brown hair. I would love to try dark orange low lites! I enjoy the variety of colors the young gals are now modeling; but at my age, I would go for a rich auburn! It would be fun to go back to nice dark red. Since I don’t put anything on my hair, not even hairspray, coloring it at all would be quite out of character for me, but if I were to color it, I would go classic Marilyn Monroe platinum blond. I would put auburn highlights in my hair for fall! Going blonde would definitely be the biggest risk for me! I still believe natural is best. Being from the Philippines, I have always liked dark hair to keep my look natural and still exotic. Any color to get a message. I think I would try blonde highlights. The most adventurous fall trend I would go for is the DIP-DYE ends. I think the pop of color would look really good in my blonde hair! I have dishwater blonde hair and have always gone really bright blonde with my color. If I was going to be adventurous, I would go the opposite direction with a rich, dark brown color – I bet that would look awesome with blue eyes! The craziest fall color that I would venture to dye my hair would be spunky red-orange curls! Can’t go wrong with a honey brown/blonde mix of color!